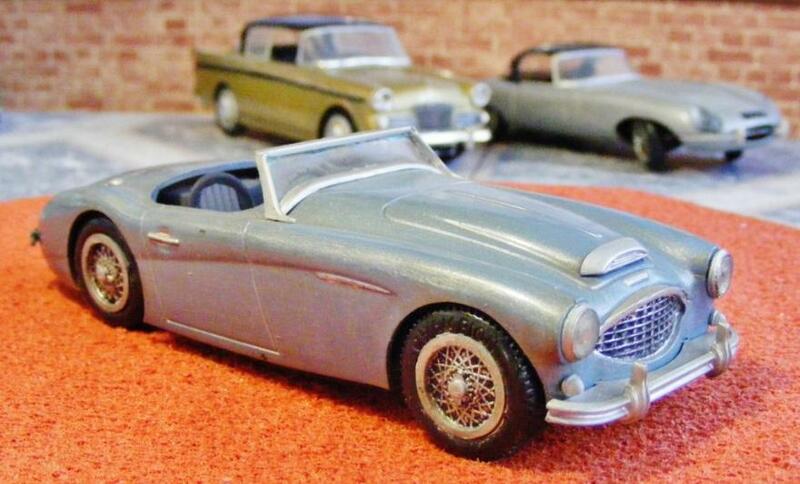 In March 1959, The Austin-Healey 3000 was introduced to replace the Austin-Healey 100-6. 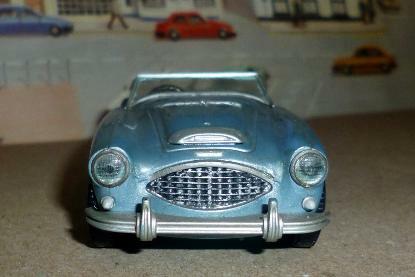 This ‘Big Healey’ as they were known because they came after the little Sprite, was a real British bulldog of a car and would become the best known of the "big Healey" models. Unless you took a look at the emblems though, the new car was rather hard to distinguish from the 100-6. 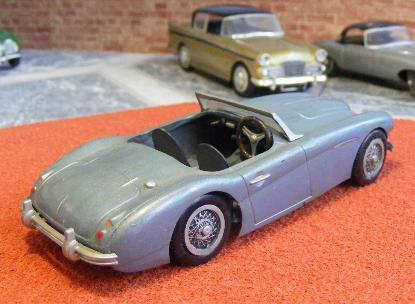 The bodywork was identical and the wheelbase unchanged, even the model options remained the same being a two-seater open sports car or a 2+2 version thereof. 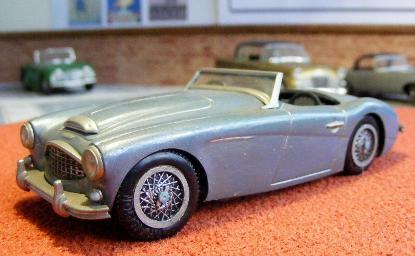 Jensen Motors fabricated the bodywork but all the other assembly was done by Austin-Healey at the Abingdon works. 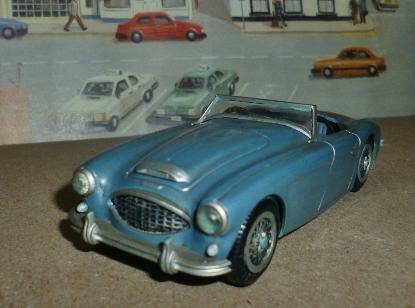 Along with the new chassis codes the Austin-Healey 3000 got a new, stronger, engine and gearbox, and, somewhat belatedly, disc brakes at the front. The latest version of the C-series straight six engine, the 29D, had a new cylinder block with a larger bore and a higher compression ratio. This brought the displacement up to 2,912cc, hence the moniker “3000”. Power output was now 124hp with 162 lb-ft of torque. 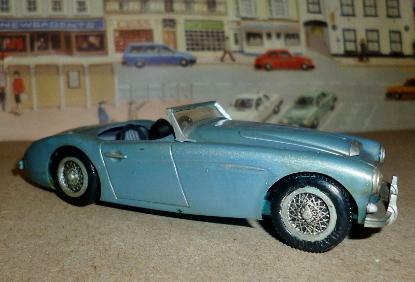 When it came to the performance this new Healey was a good step forward on the old 100-6. 0-60 mph took around 10 sec's and top speed was nearly 115 mph. When the Competition department revised the exhaust manifold, put in a hotter camshaft and added three larger S.U. H8 carburettors the “3000” became a very potent rally car. Over the net few years these cars would be driven by some of the most famous British drivers and win its class in many European rallies. BMC entered 3 cars in the Alpine Rally in June 1959 taking second in their class. Victories were also taken at the Liège and the German Rally where Pat Moss and Ann Wisdom won their class, took second place overall, and won the Coupe des Dames. In 1960 the “3000” took class wins in the Circuit of Ireland, the Tulip Rally, the Geneva Rally, the Alpine Rally, and once again in the Liège, Moss and Wisdom also won the event outright. At the end of the season Moss and Wisdom were crowned winners of the European Ladies Rally Championship and the duo were named drivers of the year. The “3000” also grabbed 1st, 2nd, 4th, 5th, 7th, 8th, and 10th places in the 1960 RAC Rally which of course brought in the team prize too. Successes continued and through 1962 when Pat Moss again took the Ladies’ European Rally Championship but this time with Pauline Mayman as co-driver. However, the “3000” never had any luck at le Mans, failing to finish in the three attempts made in 1960-61-62. Aurora kit #516-49 was a typical kit of it's era which is to say fairly simple and consisting of only 34 parts although it was quite crisply moulded in hard, brittle, plastic with rubber tires and a lady driver. 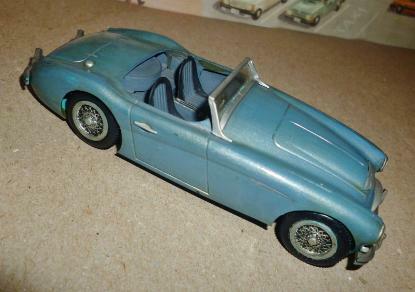 Sold in the USA in a box from 1960, in the UK this kit of the MkI 2-seater was originally sold in a bag from the very early 1960s being manufactured in the UK was by Playcraft ‘Aurora’. 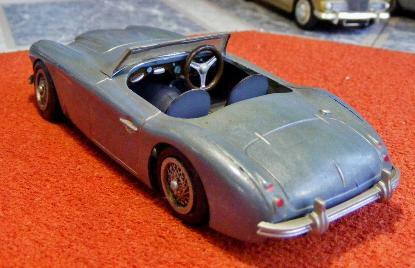 Aurora also released a “Customizing kit” # 550-79 of this car using some of the same parts as the first kit. Rod built this kit in the early 1960s and the brush applied paints, particularly the silver, have not stood up to the ravages of time. 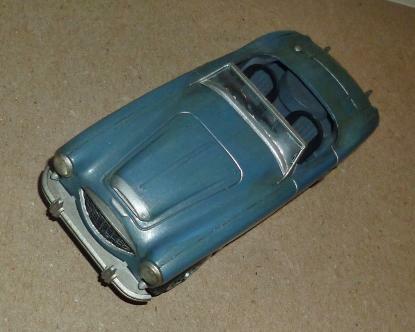 It is, however, a clear example of what the model maker had available to him in the early 1960s, not only in terms of the kit style but the enamel paints, tube glues and lack of specialist fillers etc. Metallic paints certainly didn't figure in Humbrol's product list so mixing colours was the only option. Even windscreens were something the builder very often had to scratch build from clear acetate.